Roofmax understands that having a great roof goes beyond quality shingles and tiles, it also includes having correctly installed gutters and gutter protection. Roofmax offers gutter cleaning and maintenance as well as the installation of gutters and gutter protection. Gutter protection is necessary to keep your gutter free from clutter, mold, rust, leaves, and other items that might clog your drain. To protect your home from these, you’d need a gutter guard to be installed. Gutter guards can be made of mesh, stainless steel, sponge, brush, or any other durable and light material. Sponge and brush as gutter guards provide a lightweight protection for your gutter, but are suspect to plant growth and bird seeds. The most reliable combination of gutter guard materials is the micro mesh and the stainless steel. This combination utilizes the tiny holes that are hardly visible to the naked eye. These types of guards allow water to flow through while letting debris fall off the edge of the roof. Why worry about gutter protection? Keeping debris out of your gutters helps avoid clogging, which can compromise the quality of your roof. It also prevents snow dams from forming. During the winter, people sometimes neglect the gutters. 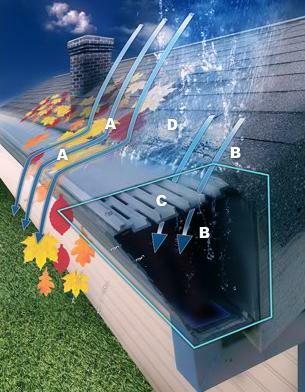 Before they know it a snow dam has formed and their gutter is already storing water that breeds moss and algae that can eat your roofs from the inside out. The quality of a gutter guard depends of the level of skill and experience of the contractors that installs it. Roofmax offers a supply and install gutter protection service to equip residential homes with a sturdy aluminum base covered fine mesh that keeps debris out while still allowing water to enter the gutter channel. We understand that having a great roof goes beyond quality shingles and tiles, it also includes having correctly installed gutters and gutter protection. Roofmax offers gutter cleaning and maintenance as well as the installation of gutters and gutter protection.